Looking for a tasty treat that takes only a few minutes of preparation to make? Then these addictive morsels are for you! The cookies have a perfect texture and can be enjoyed hot or stored in a container for a loved one’s lunchbox or an afternoon snack. My daughter, who speaks both English and French, said to me after I made these cookies today, Maman, plus les Cookies s’il vous plaît ! Preheat oven to 325 degrees. Place all ingredients except for the chocolate chips into a large bowl and beat with an electric mixer on medium speed for 2 minutes. Place a mat on top of a cookie sheet (parchment paper will also work). Drop a tablespoon of batter per cookie onto the mat, spacing each cookie at least an inch apart. Bake for approximately 22 minutes. Repeat with another dozen cookies on an additional cookie sheet. Optional-While cookies are baking, place chocolate chips into a small saucepan on the stove over low heat until the chocolate melts. Remove saucepan from burner. Take cookies out of the oven and let cool for 5 minutes. Drizzle over cookies if desired. This was shared on Fit and Fabulous Fridays, Freaky Friday, Fresh Bites Friday, Pennywise Platter Thursday, Wellness Weekend, Whole Food Fridays, Full Plate Thursday, Keep It Real Thursday, Healthy 2 Day Wednesdays, Gluten-Free Wednesdays, Real Food Wednesday, Allergy-Free Wednesdays, Virtual Gluten-Free Support Group, Slightly Indulgent Tuesday, Fat Tuesday and Monday Mania. My daughter’s last day of Preschool was last week and she’s been begging to hangout in the kitchen with me since she’s been out. First on her list for baking? Cookies. So we put on our aprons and had some fun! After making a batch of Strawberry Almond Milk together, we tackled cookies. And we were both delighted with the results. In fact, I am writing this post now just to take myself out of the kitchen where I just ate way too many of these bad boys. OK the good news is that they aren’t bad for you. They are actually quite nutritious. But they are very addicting! These cookies will keep you satisfied as they are brimming with fiber and protein from almonds and pecans. They are also rich in magnesium, potassium, Vitamin E and zinc. Add all ingredients except chocolate chips and pecans to a large mixing bowl and beat with an electric mixer on medium speed for 2 minutes. Add in the chocolate chips and pecans and mix again for another minute. Place bowl in refrigerator for 1 hour. Preheat oven to 350 degrees. Place unbleached parchment paper or a baking mat on two cookies sheets. Use a tablespoon to drop the batter on the paper or mat 2 inches apart. Bake for 12-15 minutes until golden brown. Remove from oven and let cool for 5 minutes. Vegan Option: You can substitute the 2 eggs for 2 Tbsp. flaxseed meal soaked in 2 Tbsp. water for 5 minutes. This is linked to Pennywise Platter, Better Mom Mondays, Anything Goes Linky, Friday Food Flicks, Fit and Fabulous Fridays, Fresh Bites Friday, Friday Food, Freaky Friday, Fight Back Friday, Thriving on Thursdays, It’s a Keeper Thursday, Full Plate Thursday, Tastetastic Thursday, Real Food Wednesday, Frugal Days, Sustainable Ways, WLWW, Gluten-Free Wednesdays, Whole Food Wednesday, Allergy-Free Wednesdays, Slightly Indulgent Tuesday, Fat Tuesday, Hearth and Soul Hop, Melt in Your Mouth Monday, Make Your Own Monday, Monday Mania, Sunday School Blog Carnival, Inspire Me Monday and Mix it up Monday. Delicious cookies that take 5 minutes of prep to make?! Oh yes indeed! These cookies are jam packed with protein, fiber and do not contain any added sugar. Oats and almond meal are great sources of protein while flaxseed meal contains fiber and omega 3 fatty acids. Preheat oven to 350 degrees. Line 2 cookie sheets with parchment paper (I use unbleached parchment paper). Place all ingredients into a medium size bowl. Mix with an electric mixer on low speed or a wooden spoon for several minutes. Drop teaspoonfuls of dough onto prepared cookie sheets. Slightly flatten each cookie with the back of a spoon. Bake 12-15 minutes or until golden brown. Remove from oven and let cookies cool for 10 minutes. This was shared on Made From Scratch Monday, Anything Goes Linky, Friday Food, Lunchbox Love, Friday Food Flicks, Fight Back Friday, Freaky Friday, Fresh Bites Friday, Potluck Party, Fit and Fabulous Fridays, Wellness Weekend, Pennywise Platter, Full Plate Thursday, Tastetastic Thursday, Gluten-Free Wednesdays, Healthy 2 Day Wednesdays, Whole Foods Wednesday, Real Food Wednesday, WLWW, Frugal Days, Sustainable Ways, Whole Food Wednesdays, Allergy-Free Wednesdays, Hearth and Soul Hop, Totally Tasty Tuesdays, Kids in the Kitchen, Traditional Tuesdays, Slightly Indulgent Tuesday, Fat Tuesday, Barn Hop, Just Another Meatless Monday, My Meatless Mondays, Real Food 101, Melt in Your Mouth Monday, Things that make you say Mmm, Inspire Me Monday, Creative Corner Hop, Mix it up Monday, Better Mom Mondays and Monday Mania. I adored peanut butter growing up, especially peanut butter cookies. I loved eating them warm–right out of the oven. Years later in college, I discovered almond butter and then I was really in heaven. I am still crazy about almond butter, but now I have a new favorite nut/seed butter: Sunflower Seed Butter. I’m addicted. I eat it by the spoonful, on top of bananas, on top of homemade bread…Yeah it’s pretty fabulous. It is also a great alternative to peanut butter for anyone that has a peanut allergy or avoids peanuts for health reasons. 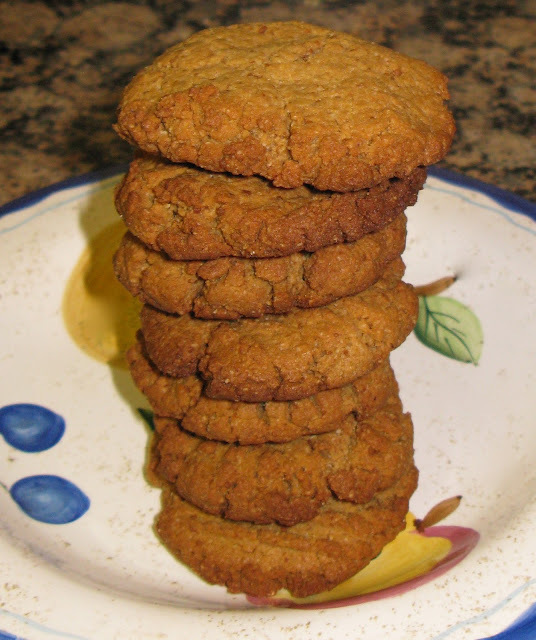 These grain-free cookies remind me of the homemade peanut butter cookies I used to gobble up throughout my childhood. Thanks to this new treat, I’ve definitely found a new go-to-cookie. These cookies are jam packed with protein and fiber from almond flour, coconut flour and SunButter. Preheat oven to 350 degrees. Add coconut flour, almond flour, sugar and shortening to a large bowl. Beat with an electric mixer on medium speed for 2 minutes. Add in SunButter and eggs and beat for another minute. Place vanilla, arrowroot, baking soda and salt into the bowl and beat for 3 minutes. Roll dough into 1 inch balls. Place balls on ungreased cookie sheet and press down lightly on each cookie with a fork. Bake for 15 minutes. Remove cookies from oven and let cool for 10 minutes. This recipe is linked to Potluck Party, Whole Foods Wednesday, Tempt My Tummy Tuesday, Barn Hop, Things that make you say Mmm, Anything Goes Linky, Fight Back Friday, Friday Food, Allergy Friendly Friday, Lunchbox Love, Fit and Fabulous Fridays, Freaky Friday, Pennywise Platter Thursday, Thriving on Thursdays, It’s a Keeper Thursday, Full Plate Thursday, Tastetastic Thursday, WLWW, Healthy 2 Day Wednesdays, Real Food Wednesday, Frugal Days, Sustainable Ways, Gluten-Free Wednesdays, Allergy-Free Wednesdays, Traditional Tuesdays, Tasty Tuesday Party, Totally Tasty Tuesdays, Hearth and Soul Hop, Slightly Indulgent Tuesday, Fat Tuesday, Mangia Mondays, Melt in your mouth Monday, My Meatless Mondays, Sunday School, Inspire Me Monday, Mix it up Monday, The Sweet Spot and Monday Mania.